Cocktail recipes specify ingredients and chilling technique, but they typically don’t tell you squat about the ideal amount of water added when you stir or shake with ice. Do drinks have an ideal dilution? We figured with the right people in the room we could probably find some consensus. We were wrong. Dave decided to test dilution values of two drinks – the Sidecar and the Pegu– by doing blind tastings spanning a range of 15-30% ABV (alcohol by volume). Dave and I served 32 consecutive shot-sized glasses of each drink, and got some of NYC’s bartending gods completely sloshed at 3 o’clock in the afternoon. The panel included: Kenta Goto, of Pegu Club; Don Lee, PDT, Momofuku Ssam; Chad Solomon, Milk and Honey, Pegu, Flatiron Lounge, Little Branch; Christy Pope of Cuff and Buttons; Scott Teague of Pegu Club and Meehan, and Eben Klemm, head of beverage for the B. R. Guest Restaurant Empire, and head of the Tales of The Cocktail Shaking Seminar. 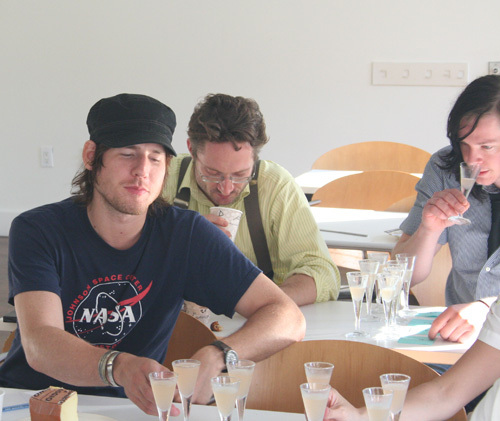 The tasting panel: (clockwise from left): Don Lee, Chad Solomon, Eben Klemm, Scott Teague, Christy Pope, and Kenta Goto. First up, the Sidecar: cognac, cointreau and lemon. Set One: 15, 16, 17 and 18% ABV. 15% rated first or second with the majority of the tasters, and18% followed as most everyone’s second choice. 16 and 17% rated lower; half the panel noted that they were too sour and acidic. Weird. 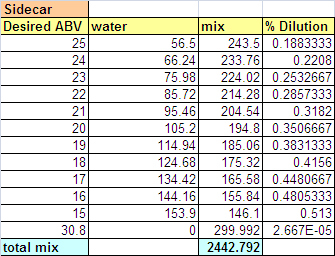 Set Two: higher ABV’s: 23, 24, 25 and a whopping 31%. 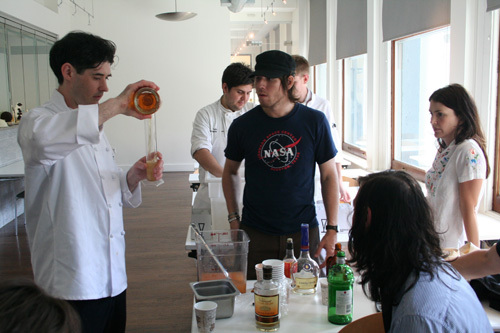 The 24 and 25% tied as favorites for the round, and the panel agreed that 31% was too boozy, 23% too light. Set Three: 19, 20, 21 and 22%. Results were all over the board. One bartender said 19% was too acidic and rated it lowest; another said it was the ideal sour and rated it tops. Two thought 20% was well-balanced, and three thought it was far too overdiluted. Most everyone agreed that 21% was the sweetest and was headed in the right direction. Dave playing bartender to the bartenders. Measuring. Set Five: 16, 17, 21 and 22%. 21% was voted first or second favorite by all. 16% was surprisingly still a favorite by half the group. 17% ranked third across the board, and 24% was agreed to be too boozy and dark. What did we learn about perfecting the Sidecar? Not much. We learned that you can’t isolate alcohol dilution like we thought we could; the variables of acidity and sugar balance really complicate things. We also saw that tasters’ impressions of a drink are significantly affected by the other drinks they are tasting next to it. Pretty fatigued at this point. Set Three: Everyone was pretty sauced, but we pushed ahead with an even stronger set of 22, 23, and 24%. No clear favorite. Set Four: thankfully, our last. 15, 16 an 17%. Kenta bowed out to go to work, so we were down to five bartenders. The outcome seemed random; everyone had a different opinion. Two said 15% was far too strong, one said it was the most balanced. One said 17% was the lightest while two claimed it was the most acceptable. 16% was evenly split, too strong for some, and too diluted for others. After all this: no clear answer on our panel’s preferred dilution. We were shocked by the utter lack of consensus. Each set determined the limits of perceived dilution and liquor and/or acid balance. We must have structured the tasting poorly; arguments erupted over whether the inclusion of bitters had mucked everything up, whether the drink choices had been appropriate, whether we could taste accurately at 0°C. 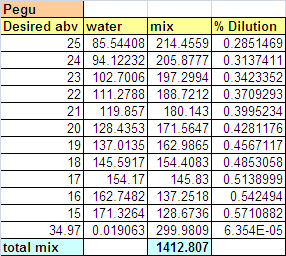 Hard to tell from the raw data, but we suspect that acid and alcohol can come in and out of balance at different dilutions. We vowed to re-convene and taste two drinks with lime and sugar, one rum, one gin, then taste straight gin dilutions and straight limeade dilutions to try and figure out what the hell’s going on. 2: Temperature, Dilution, and Ice. 3: Why do my shaker cans get stuck together? Fascinating stuff here. Perhaps having each taster isolated, so his opinion is not swayed by the taster next to him? Maybe. We tried to limit any discussion till after people had recorded their impressions, but once people started talking some revision might have taken place. Did you simply added water to achieve the dilution required? How did you chill them? The selection of ABV / set looks pretty random to me. any particular reason on choosing those ABV’s? If memory serves we diluted all the drinks with water, bagged them (without vacuum) and chilled them in an ice bath for equal amounts of time. On the side car he first 3 sets were grouped into ABV ranges. Instead of going low/middle/high, we went low/high/middle, just to mix it up a bit. Set 4 was basically a repeat of set 3 with a curve-ball low thrown in and one of the favorites removed (everyone agreed the high-booze set wasn’t superior to the middle booze set as a whole, so they weren’t re-tested). Set 5 was another tweaking. On the Pegu the first 3 sets were straight up low/med/high except in set 2 we swapped two well-performing low-abv’s in to double check. We probably shouldn’t have. By the time the fourth set rooled around were were palate fatigued and confused and consternated at our results so-far.